Since the stickied thread on how to setup a glass tank no longer has any pictures that still work I figured I would post a new one. This thread will cover how I setup a glass tank. It isn't the only way to do so, but it is what I have found to work the best for me. I will provide links to recommended products, and pictures whenever possible. 2. A Screen Top for the tank. 3. A UTH (Under Tank Heater) Your UTH should cover about 1/3 of the bottom of the tank. Step 3: Using foil tape secure the UTH to the bottom of the tank. Make sure to keep the UTH pressed down against the glass. The tighter down it is the better the UTH will heat the cage. Step 5: Turn the cage over 180 degrees so the other side is facing up. Repeat step 4. Step 16: Plug the UTH into the thermostat, then the thermostat into the wall. Plug the lamp dimmer into the wall as well. The process of adjusting your heating system involves using your probed thermometer to read the current cage temperatures and either increasing the amount of heat added to the cage or reducing it. You want your thermostat set to whatever temperature makes the probe on your thermometer read between 88-92 F.
You want to adjust the lamp dimmer until the cool side thermometer reads between 78-82 F.
To adjust humidity in the cage you can mist with a spray bottle and warm water. If your cage has too much humidity you can remove some of the foil on the screen top. 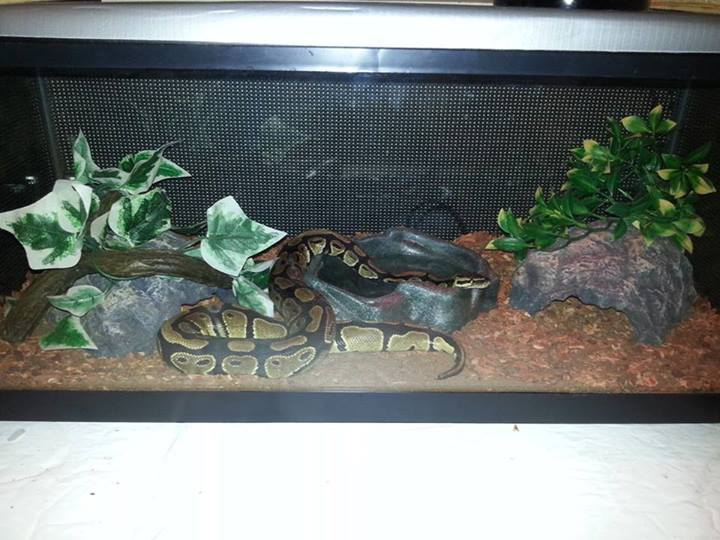 Once you have your cage temperatures and humidity in the proper ranges you can introduce your snake to it's new home. The UTH is used to generate the hot side basking temperature. Since UTH's don't change the temperature of the air in the tank the heat lam pis required to maintain the cool side/air temperatures in the cage. The substrate needs to be thin for the same reason. UTH's only heat surfaces they come into direct contact with. If the substrate layer is too thick the UTH will be completely useless. The foil on the screen top is used to reduce airflow in the cage to help maintain high humidity levels. You don't want to cover all of the screen top though as your snake still needs fresh air. Professionally made PVC reptile cages: http://ball-pythons.net/forums/showt...With-Pictures! If you have any questions, comments, concerns, or improvements feel free to post them below, or send my a private message. I'll be happy to help in any way that I can. Last edited by The Serpent Merchant; 09-01-2013 at 12:05 AM. I have found that it is nice to actually attach the heat lamp to the screen top. This makes opening the cage much easier. Step 1: Make sure your heat lamp is unplugged, not sitting on the screen top, and there is no bulb in it. Step 3: Using the drill and 1/4" bit drill 2 holes using the dents from step 2 as a guide. Step 4: Screw the heat bulb back into the lamp fixture, and place back on the screen top. Using the 2 zip ties attach the heat lamp to the screen top. One question.... You placed the thermostat probe right up the center <clear part> of the heat mat as apposed to on the tinted/black part... Why? p.s. the upside-down pics made me giggle. I center the probe because it makes it easier to tape down the UTH, and the entire UTH heats up enough that it shouldn't make any real difference. Mine sits pretty darn snug but it bugs the heck out of me that it isn't perfectly flat <that's my OCD kicking in.>. I'm still quite torn on where to go from here, I know I'll never do a rack system, the animal plastics T-8 really appeal to me but I love the visual from my tanks since I finally got my humidity dialed in. *sighs* I will however be ordering my herpstat 2 within a few days. Once that comes in, I'll be doing some remodeling. Are the probes on the herpstat as fat as the one on the hydrofarm? p the mat all nice and flat if you can run the probe right up it, tape it in place and position the mat directly on top? This is why I love my tank, he always comes out exploring after I clean mess with stuff. Of course, nice fresh clean water must be messed with. Last edited by The Serpent Merchant; 09-01-2013 at 01:05 AM.